No more store-bought ice-cream or sorbets for us has not meant foregoing refreshing desserts! This is one example of what you can make without much fuss. – 1 egg white* OR the equivalent in chickpea juice, from a can of drained chick peas. – 1 TBSP homemade powdered sugar = pure untreated cane sugar or coconut sugar, blitzed in my good old electric coffee grinder or in your food processor. – a few raspberries: if not from my garden, I buy them organic to avoid pesticides. Frozen rapsberries are fine too. 1. Using an immersion blender, puree the mango flesh into a very smooth pulp. 2. Beat the egg white or the chickpea juice until peaks form (it takes up to 10 minutes for the latter). Add in the TBSP sugar towards the end. 3. 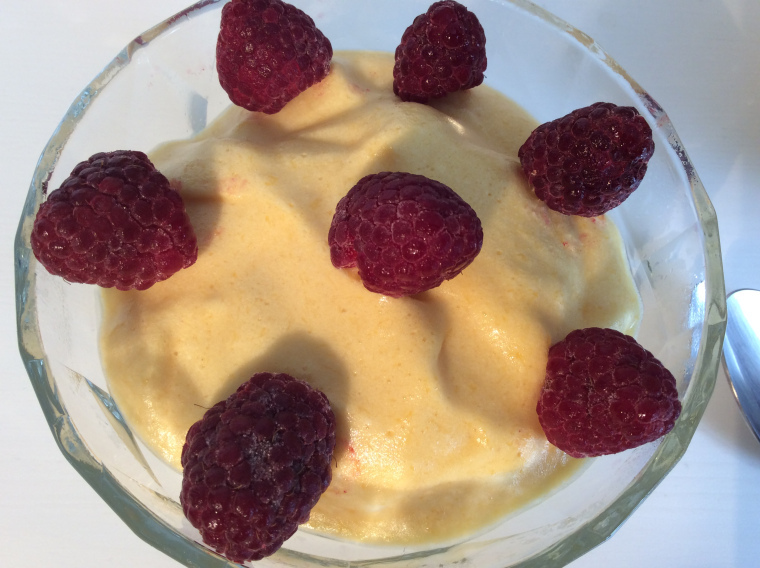 Gently fold the blended mango into the mousse. This process is easier, and the result more colorful, in the vegan option. 4. Pour into small bowls and freeze for about 3 hours. Beyond that time, the mousse will be just as tasty, but a little harder. 5. top with a few raspberries for the final touch. Yummy! A dear neighbour has to confess something. I have jumped the fence and absconded with your recipe. 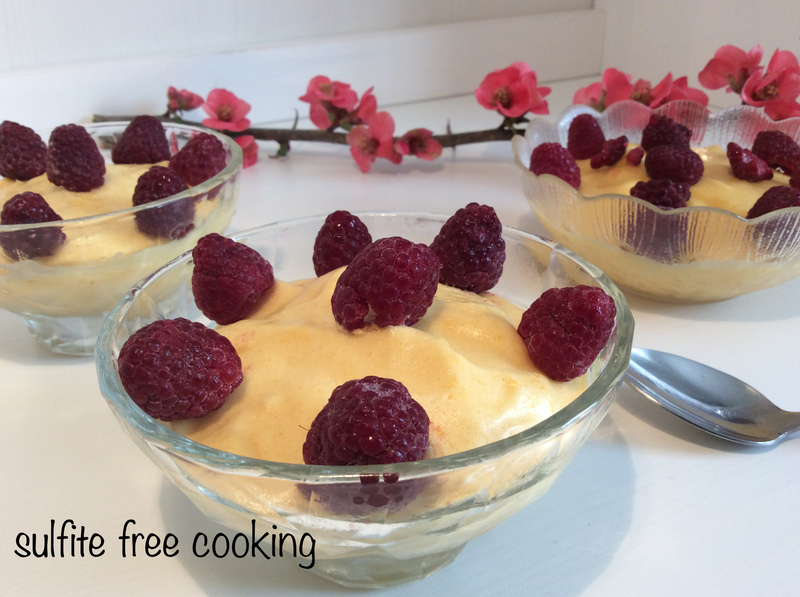 Shameful I admit, but still here it is: https://pepsfreefromkitchen.wordpress.com/2017/04/04/frozen-mango-mousse/. I hope it meets the standard set by the original. I loved it and I hope others will come here and try it out too. So, thank you for the recipe.